Today is January 20th and I'm STILL having a hard time remembering to write 2012 on my checks. Anyone else having this problem? I just keep asking myself, where does all the time go?? This is an entire 18th century oak panelled room. Look at the hand carved details! This is one of three JL Mott earthenware bathtubs that we currently have in stock. Great condition with light crazing. This lot of subflooring was salvaged from a 1750's home. The boards range in width from 6-14" and lengths to 16'. This will be a beautiful floor once it is installed and refinished. 850 s.f. available. This chandelier...what can we say, it's beautiful. Hope you enjoyed this update. Attention Nor'East Customers...if you emailed us in the past 2 days and have not received a reply please resend your email. We suffered an unexpected crash that resulted in approx. 2 days worth of emails being deleted. We apologize for any inconvenience this may cause!! Once again I apologize for the lack of updates to this blog. A very busy summer has turned into a very busy fall (we aren't complaining!!). A few weeks ago we were contacted by the producers of the DIY networks Worst Kitchen in America Contest. They asked us to help with the renovation of the contest winners kitchen. Needless to say we jumped at the chance. A week or so later we met with them and helped them choose a few key pieces to incorporate into the new kitchen. We were thrilled with their desire to incorporate architectural salvage into the design. Here are a few pictures of the door we helped them choose for the project. This door will become a sliding pantry door, and I'm sure a focal point, for the kitchen. This is a fantastic English Stained Glass Door. Great condition, stripped and ready to go. John Isgur, co-owner of Nor'East Architectural Antiques, filming a segment for the Worst Kitchen in America television show. Well I am extremely happy to announce that after a few very long weeks the upgrades to our website are almost complete. In the next 24 hours you should see a number of changes as the new site goes live. For those of you who loved the site the way it was, DON'T WORRY! I am sure you will agree with me when I say that the new site will have everything you loved about the old site, with upgrades to make it easier to maneuver around. Please check it out, and leave comments (or send emails) with any feedback you may have. An upgrade of this size can be a little nerve wracking for me (I hand code the entire site). It seems like we have spent this entire week just digging out from under the snow, and at this writing, its still snowing! We've had a little time to start unloading some of our trailers that are filled with inventory. We we found so far were a lot of corbels and brackets (check out our updated millwork page), lots of 4 and 6 panel doors, mantels and large quantity of tin ceiling. Brian had a little time between snow plowing so he restored a great 19th century butlers pantry. He's also hanging a massive brass chandelier salvaged from the Mission Hill Theater. Donna has been very busy updating the website so you can expect to see a few design changes there in the upcoming weeks. She has also set a goal to double the size of the site by this spring. A huge undertaking that I'm sure our customers will appreciate. I have looked at several salvage jobs in Boston this past week, one of which we should be starting Monday. This job has lots of lighting, soapstone sinks, library card catalogs, and other very interesting finds. We'll keep you posted on future happenings. Things are moving along very fast these days. 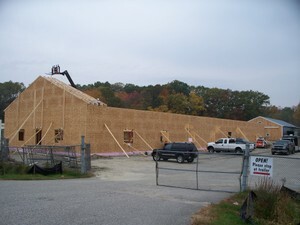 Here is a picture of our new building that I took this morning. As you can see all of the painting has been finished and the antique posts and beams have been installed. What a job that was! Here are a couple pictures of that process so you can fully appreciate what a great job everyone did. 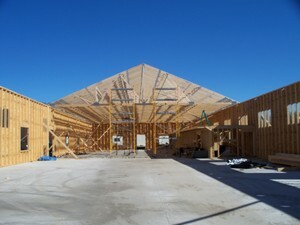 All of these beams were installed in the span of 10 days! Someone pointed out to me that its been a month since my last update here. That shows you how busy we've been. But, since I know how much everyone likes to see the progress we have been making I thought I would take a minute and show you. First, they finished the sheetrocking. And then Mike started to tape and plaster. Well this week we reached a milestone. The contractors started installing sheetrock. If you had told us on June 4th that on January 7th we would still not be in our new building I probably would have laughed at you, but I'm not laughing now...not that I blame anyone, things just move a little slower during the winter in New England. But on the bright side, Brian and I have been working diligently on our new heating system. Back on September 17th we posted pictures of the guys installing our radiant heat tubing. Now we've finally reached the point where we are setting up our salvaged Weil Mclaine oil boilers (which we plan to run bio-diesel in). Eventually we plan to install solar panels on the roof to run the system. The building was designed to be very tight and evergy efficient so it should not take a lot to heat it. Here is a picture of one of the three radiant heat manifolds. By this time next week the heat will be on. In closing, Donna and I would like to wish all of our customers a Happy New Year. Lets hope 2009 turns out to be a bit better than 2008!